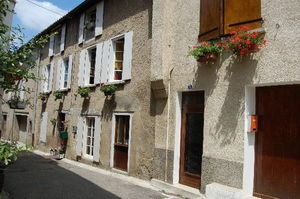 Spacious House in center of medieval village,quiet location lots of free car parking. The area is rich in history going back to pre roman times,Cave paintings,Walks,Cycling,( bike hire can be arranged) Sailing,Skiing in season.and lots more. Under an hour from Carcassone air port,collection can be arranged-or hire a car through ryan air. Ideal centre for a touring holiday also a good stopping off point for those heading south.